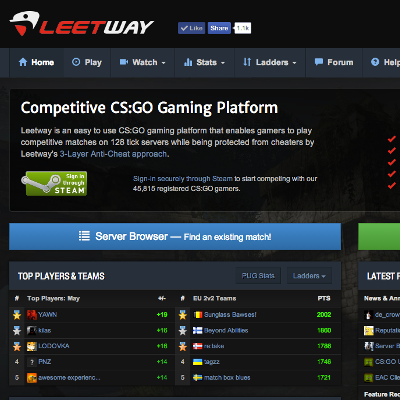 Strategy Star developed a robust community website and an integrated server software suite for Leetway Inc.
From 2013 to 2014, Leetway hosted a Beta service for Counter-Strike: Global Offensive. During the Beta, the software we developed was used to operate over 70,000 online CS:GO matches for over 45,000 users. The community website was integrated with the Steam Community API and OpenID service, so the CS:GO gamers could seamlessly log-in to Leetway with their existing Steam accounts. The website boasted features including Forums, account management, profiles, teams, matches, statistics, ladders, videos, screenshots, as well as robust administration tools that Leetway administrators and moderators used to manage operations. To operate a world-wide network of game servers, we built a server software that provisioned game servers in real-time as CS:GO matches were initialized on the community website. Players would create and join match lobbies on the website and then be prompted to connect to the provisioned game server when enough players had committed to play. In addition to being able to play through the website, we built a custom desktop application which was integrated with the Easy Anti Cheat (EAC) tool used to prevent and catch cheaters. To make a full-cycle integration between the website, desktop client, and the game servers, we also developed a plugin for the CS:GO game server itself. We used SourcePawn and SourceMod to build a system that managed the CS:GO matches in-game and essentially acted as the referee. 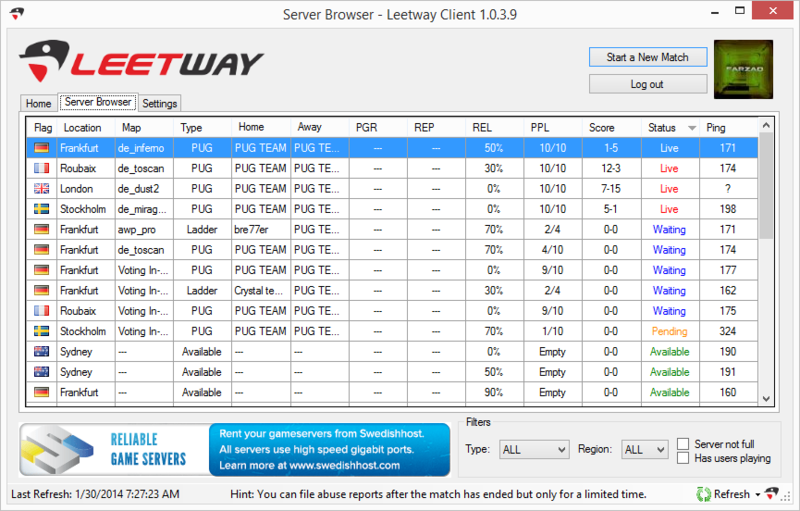 The plugin would ensure that the correct players joined the server, that they played on the correct teams, kept score, changed maps, switched teams at half time, operated overtime scenarios, recorded GOTV demos, sent real-time notifications to a REST API, and finally submitted match-end statistics and data to the community website for processing and publication. All the different components that we developed came together to form an epic competitive gaming hub that facilitated well over 35,000 hours of gaming fun during the 2013-2014 beta.